KANSAS CITY, Kan. — More than 70 Catholics gathered at Sacred Heart Church here on Oct. 28-29 to prepare for a four-year process of reflection that will culminate in a national meeting in Dallas in 2018. The local Encuentro (meaning “encounter” or “meeting”) was a preparatory training of lay Hispanic parish leaders from eight parishes in Wyandotte and Johnson counties. They were being prepared to participate in the four-year process, begun in 2015, of pastoral reflection on the parochial, diocesan, regional and, finally, national level. “This was a training for the work and the process that needs to be done until we have the archdiocesan celebration of the Encuentro on Nov. 18, 2017,” said Father Gianantonio Baggio, CS, director of Hispanic ministry for the archdiocese. The Dallas gathering in 2018 will be the fifth national Encuentro, the previous ones being in 1972, 1977, 1985 and 2000. The U.S. bishops are organizers and sponsors of the Encuentro process. They are doing it in response to the growing numbers of Hispanic Catholics, who now represent close to half of the Catholic Church in the United States. The Encuentro process is also intended to raise up new leaders — from parishes, but also from schools, and other interested programs and agencies. Past Encuentros led to the establishment of new organizational structures and initiatives within the church, and generations of new leaders. 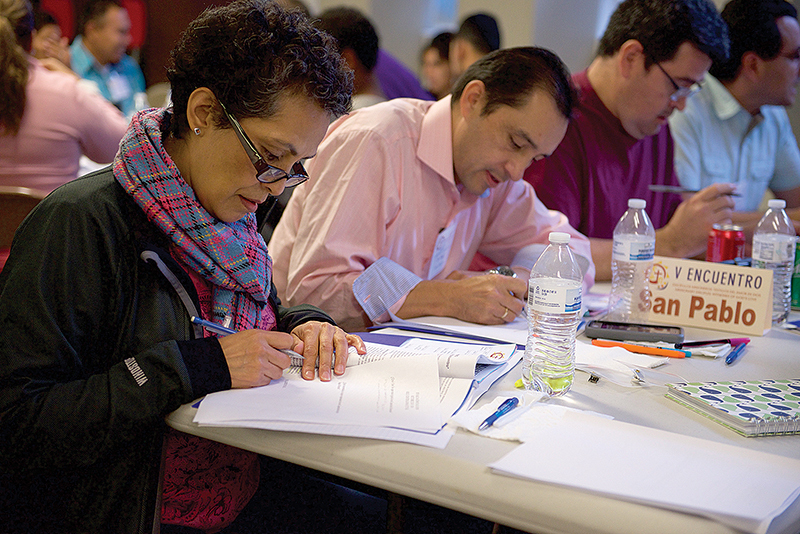 Individuals currently involved in Hispanic ministry in parishes and Catholic schools were the first cadre of people to be invited to Encuentro training. The archdiocesan Hispanic ministry office invited 10 people per parish. The archdiocesan Encuentro participants will ask their fellow parishioners certain questions. These include: What is the church doing for you? How do you feel about the Catholic Church? Do you feel like part of the church? Does your priest serve you? The answers to these questions will be gathered and eventually become part of the national Encuentro. A second Encuentro was held on Dec. 3 at Our Lady of Guadalupe Church in Topeka for the western and southern parts of the archdiocese. Hispanic Catholics from Topeka, Lawrence and Emporia were invited to this event. The regional Encuentro will lead to the national Encuentro in 2018.